Dinosaurs have always filled me with wonder, curiosity, and delight! They are amazingly cool!!! In this collection of dinosaur paintings and paleo-art drawings I explore what it means to take joy in being oneself, while breaking boundaries – and smashing through stereotypes. An herbivorous dinosaur called Kritosaurus is portrayed with a red crest and primitive green and blue feathers. Kritosaurus may actually be the same dinosaur as Gryposaurus. In this illustration, the crest has been envisioned as an inflatable facial feature that could be used to send signals to other Kritosaurs. Watercolor. © 2015 by Kristen Girard. 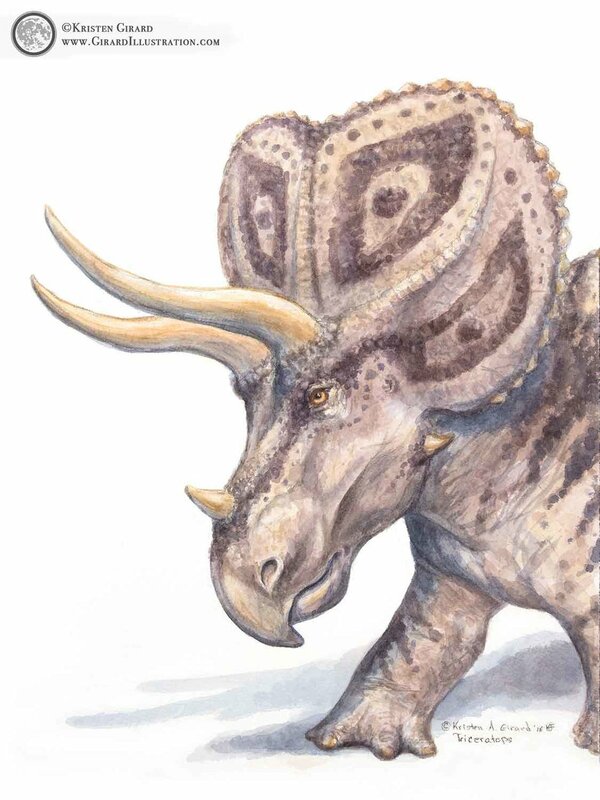 Pachycephalosaurus wyomingensis is a bipedal herbivorous dinosaur with a thick dome of bone on its head. Watercolor. © 2015 by Kristen Girard. A Guanlong wucaii hisses and lunges forward on the hunt. 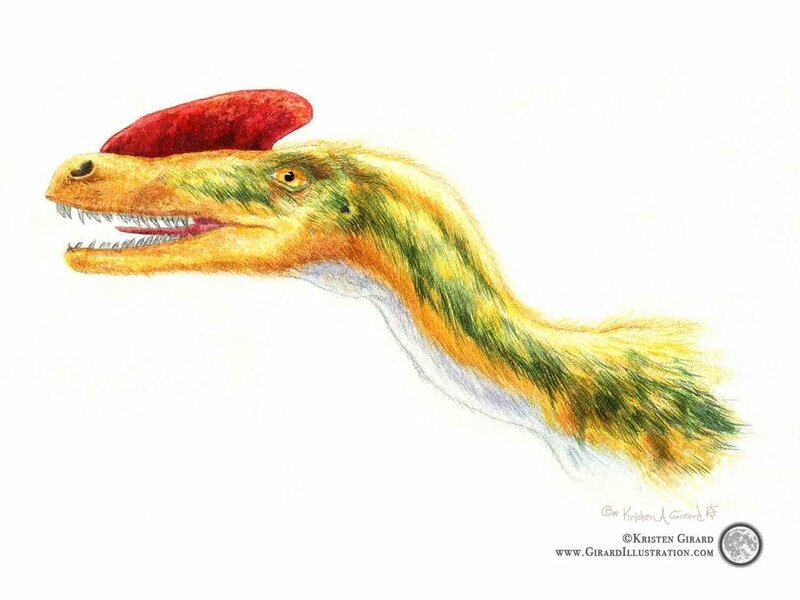 Guanlong is a carnivorous theropod with a distinctive facial crest. 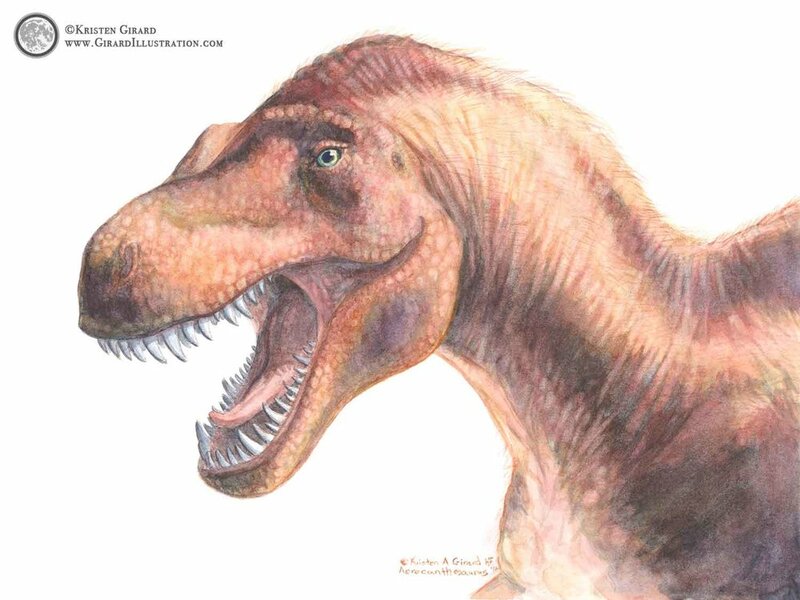 The world famous Tyrannosaurus rex is an evolutionary cousin. Watercolor. © 2006 by Kristen Girard. A blue Tyrannosaurus rex with a yellow feather crest roars and shows his teeth. Watercolor. © 2006 by Kristen Girard. It started with a child's giggle. After a a wonderful day at the American Museum of Natural History in New York City, I observed a mother reading a story to her children. The children were giggling and jumping up and down as the subway we were on traveled downtown. 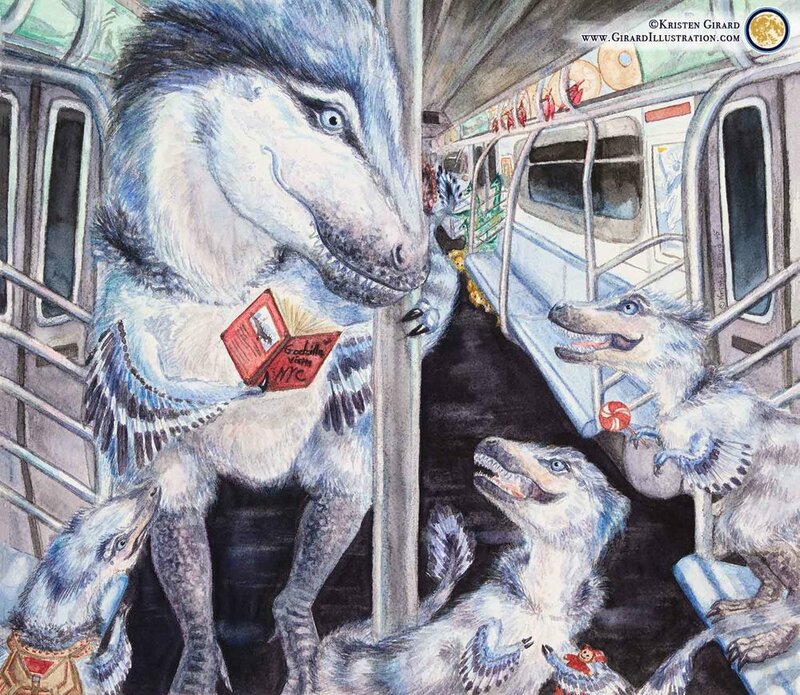 Having just spent some time admiring the Tyrannosaur rex at the museum, my imagination took the leap to a Tyrannosaur family riding the subway together. Imagining dinosaurs living their lives in our world has become a favorite past time of mine. In this new and fresh collection I illustrate what it may have looked like for dinosaurs to adventure around the modern world, with a big toothy smile full of humor and good natured fun. Enjoy! These colorful watercolors, oil paintings, and drawings feature dinosaurs doing what they love to do – the illustrations are in turns beautiful, sometimes boldly realistic, often humorously adventurous, and always thoughtful. Sign up now to get delightful nature inspired art + story letters magically sent via the web straight to your inbox. We respect your privacy and protect it fiercely like a mother Tyrannosaurus rex does her chicks - with love.